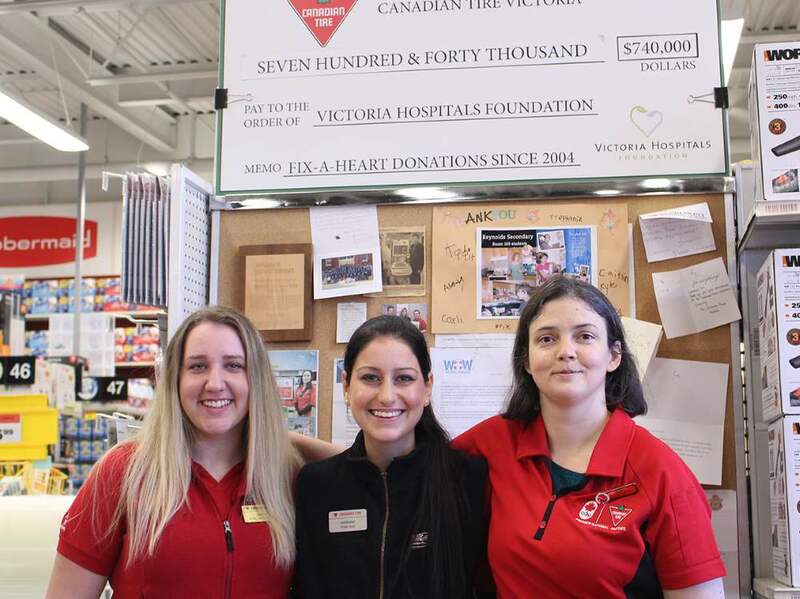 Canadian Tire has launched its 16th annual Fix-A-Heart campaign to support the Victoria Hospitals Foundation’s current You Are Vital campaign at Royal Jubilee Hospital (RJH). From November 22 until December 24, customers at the Hillside, View Royal and Royal Oak stores, as well as the Gordon Head automotive centre, can donate any amount at the till towards urgently needed cardiac equipment. The stores will match customer donations up to $20,000 to reach their goal. This year, in conjunction with the Victoria Hospitals Foundation’s You Are Vital campaign, Fix–A–Heart donations will help purchase central monitoring equipment that allow the Heart Health care teams to monitor the vital signs of cardiac patients. The new equipment is an essential communication tool that benefits the most critically ill. The central monitoring system gives a centralized, consolidated view of each patient’s current status and alerts caregivers to any changes or trends in a patient’s symptoms so they may intervene even faster — enabling immediate, informed action. Since 2003, the Fix-A-Heart campaign has raised more than $798,000 for cardiac care on Vancouver Island. Their ultimate goal is to reach $1 million. Royal Jubilee is the Heart Health referral centre for all 767,000 residents of Vancouver Island. The Heart Health program administers to cardiac needs such as open-heart surgeries, angiograms, angioplasties, cardiac device insertions and electrophysiology procedures. Every year, over 200,000 Vancouver Island residents undergo cardiac assessment and more than 6,300 cardiac procedures. In 2018, this dynamic program celebrated its 25,000th open-heart surgery — a monumental milestone.